The town castle was built gradually. The parish church was built as the first structure in the 13th century and fortifications were added to it in the 15th century. Earth ramparts and palisades were later replaced by tall stone walls fortified by bastions and a water dike. In the 16th century, the Turkish threat called for further fortifications. Only a quarter of the original town walls and three bastions - Farská (Parish), Banícka (Mining), and Pisárska (Scriveners) - of the original four have survived. 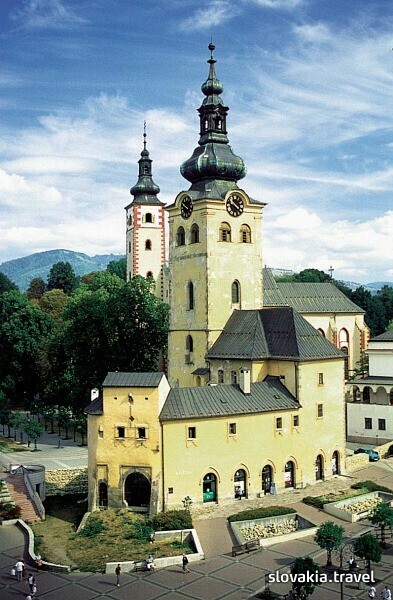 The castle's surrounding area includes not only a parish church and fortifications, but also the Church of the Holy Cross - Slovak Church, which was built in 1452, as well as a barbican with a tower. It used to be the entry gate to the castle. The barbican acquired its present Baroque facade after fire in 1761. Between 2005-2006 the barbican was restored again. Located in the centre of Banska Bystrica, Penzion Moyzes offers rooms with wooden furniture and free WiFi access. Free private parking is possible on site. Hotel Arcade sa nachádza v historickej budove zo 16. storočia na malom námestí v centre Banskej Bystrice. Bezplatne vám ponúka pripojenie na internet a parkovisko. Vo všetkých izbách je vám k dispozícii satelitná TV, minibar a kúpeľňa. Využívať môžete bezplatné káblové pripojenie na internet. Na Námestie SNP s vežou s hodinami, k historickým budovám, do reštaurácií a barov sa dostanete pešo za 2 minúty. Urpin City Residence is just 150 m away from the State Opera, in Banska Bystrica’s historical centre. Its modern and spacious studios have free WiFi and well equipped kitchenettes with electric cookers. Situated in the historical centre of Banská Bystrica, popular winter and summer tourist destination with an easy access to the surrounding mountains, Penzión Grand offers accommodation in rooms, free WiFi and free on-site parking. Housed in a listed building in Art Deco style, the Narodny dom hotel is the only hotel in Banská Bystrica located directly in the historical centre next to the main square.